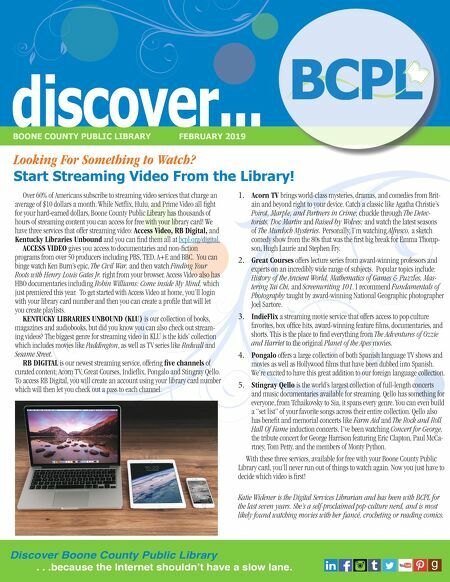 discover... BOONE COUNTY PUBLIC LIBRARY FEBRUARY 2019 L Boone County Public Library BCP Over 60% of Americans subscribe to streaming video services that charge an average of $10 dollars a month. While Netflix, Hulu, and Prime Video all fight for your hard-earned dollars, Boone County Public Library has thousands of hours of streaming content you can access for free with your library card! We have three services that offer streaming video: Access Video, RB Digital, and Kentucky Libraries Unbound and you can find them all at bcpl.org/digital. ACCESS VIDEO gives you access to documentaries and non-fiction programs from over 50 producers including PBS, TED, A+E and BBC. You can binge watch Ken Burn's epic, The Civil War, and then watch Finding Your Roots with Henry Louis Gates Jr. right from your browser. Access Video also has HBO documentaries including Robin Williams: Come inside My Mind, which just premiered this year. To get started with Access Video at home, you'll login with your library card number and then you can create a profile that will let you create playlists. KENTUCKY LIBRARIES UNBOUND (KLU) is our collection of books, magazines and audiobooks, but did you know you can also check out stream- ing videos? The biggest genre for streaming video in KLU is the kids' collection which includes movies like Paddington, as well as TV series like Redwall and Sesame Street. RB DIGITAL is our newest streaming service, offering five channels of curated content; Acorn TV, Great Courses, Indieflix, Pongalo and Stingray Qello. To access RB Digital, you will create an account using your library card number which will then let you check out a pass to each channel. 1. Acorn TV brings world-class mysteries, dramas, and comedies from Brit- ain and beyond right to your device. Catch a classic like Agatha Christie's Poirot, Marple, and Partners in Crime; chuckle through The Detec- torists, Doc Martin and Raised by Wolves; and watch the latest seasons of The Murdoch Mysteries. Personally, I'm watching Alfresco, a sketch comedy show from the 80s that was the first big break for Emma Thomp- son, Hugh Laurie and Stephen Fry. 2. Great Courses offers lecture series from award-winning professors and experts on an incredibly wide range of subjects. Popular topics include: History of the Ancient World, Mathematics of Games & Puzzles, Mas- tering Tai Chi, and Screenwriting 101. I recommend Fundamentals of Photography taught by award-winning National Geographic photographer Joel Sartore. 3. IndieFlix a streaming movie service that offers access to pop culture favorites, box office hits, award-winning feature films, documentaries, and shorts. This is the place to find everything from The Adventures of Ozzie and Harriet to the original Planet of the Apes movies. 4. Pongalo offers a large collection of both Spanish language TV shows and movies as well as Hollywood films that have been dubbed into Spanish. We're excited to have this great addition to our foreign language collection. 5. Stingray Qello is the world's largest collection of full-length concerts and music documentaries available for streaming. Qello has something for everyone, from Tchaikovsky to Sia, it spans every genre. You can even build a "set list" of your favorite songs across their entire collection. Qello also has benefit and memorial concerts like Farm Aid and The Rock and Roll Hall Of Fame induction concerts. I've been watching Concert for George, the tribute concert for George Harrison featuring Eric Clapton, Paul McCa- rtney, Tom Petty, and the members of Monty Python. With these three services, available for free with your Boone County Public Library card, you'll never run out of things to watch again. Now you just have to decide which video is first! Katie Widener is the Digital Services Librarian and has been with BCPL for the last seven years. She's a self-proclaimed pop-culture nerd, and is most likely found watching movies with her fiancé, crocheting or reading comics. Looking For Something to Watch? Start Streaming Video From the Library! Discover Boone County Public Library . . .because the Internet shouldn't have a slow lane.